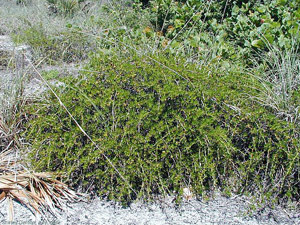 General Landscape Uses: Groundcover in dry, open areas, mostly along the coast. Wildflower and rock gardens. Ecological Restoration Notes: A relatively common element of coastal uplands along both coasts. 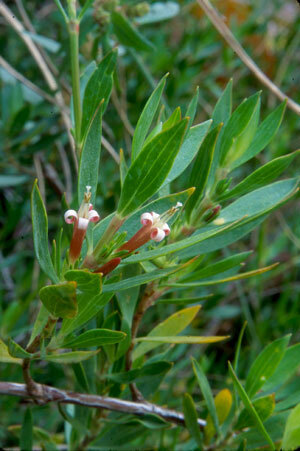 Probably not present in pine rocklands in southern Miami-Dade County, where the critically imperiled E. cokeri occurs, except on Long Pine Key in Everglades National Park. 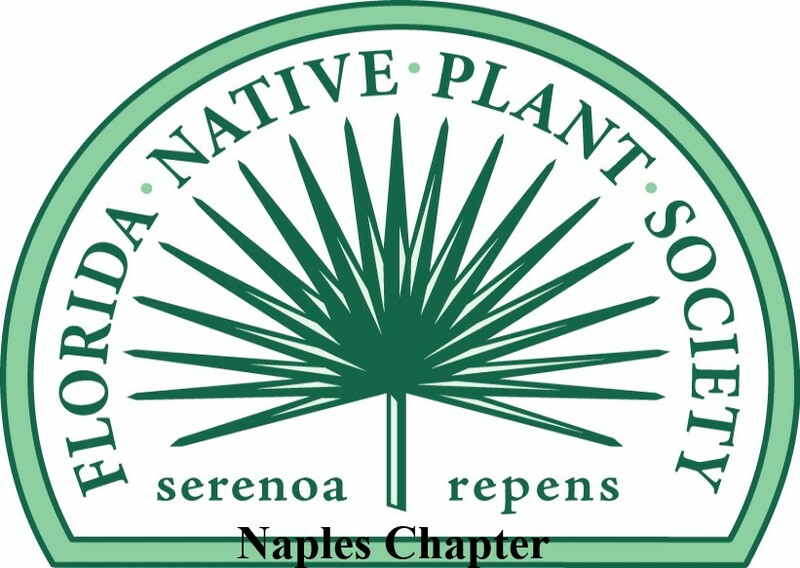 Availability: Native plant nurseries. Available in Lake Worth at Indian Trails Native Nursery (561-641-9488), in Lake Worth at Amelia's SmartyPlants (561-540-6296), in Boynton Beach at Native Choice Nursery (561-756-4370), in Largo at Wilcox Nursery and Landscape (727-595-2073) and in Sanibel at the Sanibel Captiva Conservation Foundation (239-472-2329). Description: Small sprawling shrub, woody at the base. 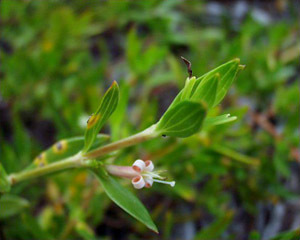 Leaves clustered toward the ends of the stems, bright glossy yellowish-green, about 1-1 1/2 inches long. Dimensions: About 1-3 feet in height. Rooting from stems touching the ground and becoming much broader than tall. Range: Monroe County Keys north along the coasts to Volusia, Hillsborough and Pinellas counties; West Indies, Mexico and Central America. 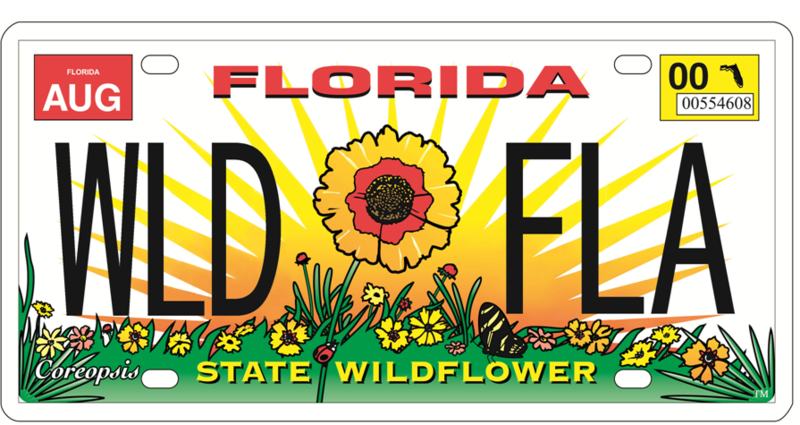 Habitats: Coastal thickets throughout South Florida and pine rocklands on Long Pine Key in Everglades National Park and in the Florida Keys. 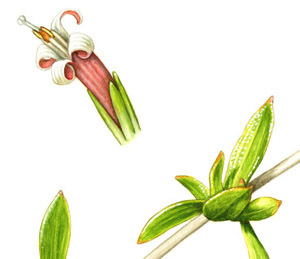 Flower Color: Pinkish-white or white. 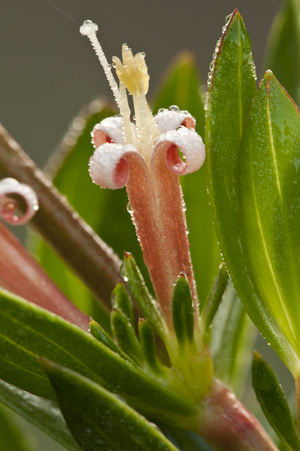 Flower Characteristics: Semi-showy, about 1/2" long. 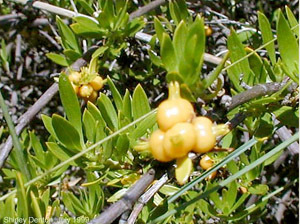 Fruit: Round golden-yellow berry containing a single seed, in dense clusters. All year; peak winter-spring. Wildlife and Ecology: Provides food for birds. Horticultural Notes: Primarily grown from cuttings under mist. Comments: An excellent groundcover in open, dry sites along the coast.